Robert Christopher's Robert and Frances Flaherty: A Documentary Life consists primarily of journals, diary entries, and essay fragments that detail Flaherty's experience in the Arctic up to and including the filming of Nanook of the North, the most famous film about the Inuit ever made. The Flaherty who emerges from its pages is a man with almost no interest in his subjects except when they can be translated into cinematic images. In retrospect, he seems to have been not so much a romantic - a trait for which he's been both celebrated and blamed - as he was a flagrant purveyor of romanticism. Here, more or less, are the facts. As a young man, the future film-maker went north to search for iron ore. He kept diaries about his travels that contain an inordinate amount of information about, for instance, wind direction. 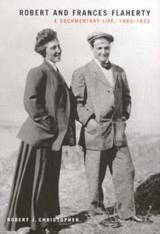 In 1914, he married a Bryn Mawr bluestocking named Frances Hubbard, who immediately became his agent and publicist. He now began writing his diaries, taking photographs, and making mini-movies with an eye to the marketplace. Much of what he accomplished was pure invention. To call his first full-length film, Nanook of the North, "an anthropological documentary" (as the book's publicity claims) is utter nonsense. Here's an example of Flaherty's capacity for invention. As Nanook of the North was playing in theaters around the world, Flaherty would tell reporters that Nanook -- actually, a man named Allakarialluk -- had died of starvation. Certainly, starvation is in keeping with the hostile environment portrayed in the film. Not too long ago I visited Inukjuak, where much of Nanook was filmed, and mentioned the starvation story to a 93 year old cousin of Allakarialluk's. The old man gave me an incredulous look. His cousin had died of "white man's disease" (brought north by Flaherty? ), not starvation. "Every time a ship came here from the outside," he added, "all of us would get sick." If Flaherty was merely a fabricator, that would be one thing. But he could also be quite patronizing toward the Inuit, whom his diaries typically refer to as "Huskies." One example will suffice: the Inuit, he writes, "are children, mentally in particular and should always be treated as such, for like children are their petty faults and jealousies, demanding much patience from their Kabloona." Of Allakarialluk, he says: "Nanook's laziness reached a climax today. Riding on the sledge much too often and not doing his share. Filling his pipe whilst the sledge barely strained over heavy drifts. Busted him off, scattering his pipe, match safe, tobacco box and him in snow." I dare say this puts into a curious perspective Nanook's Noble Savage heroics in his eponymous film. Christopher, apparently a gentleman as well as a scholar, does not remark upon Flaherty's attitude toward the Inuit. After all, he's more of an editor than an author here. And therein lies the rub: a biography of Flaherty's years in the North would have been considerably more valuable than this so-called documentary life. Still, the book does perform an important service, since it blows the whistle - however unwittingly - on a long-time Arctic icon.